The Rewined Blanc Collection features clear bottles and up-and-coming varietals, along with some more old-world, established grapes, that are worthy of more exploration. The inspiration came from the idea that learning about wine varietals through fragrance is an enjoyable way to expand your wine knowledge and pallet. The Blanc collection candles are made of 11 oz. of hand-poured sox wax. Each candle is handcrafted from a repurposed wine bottle in Charleston, South Carolina. Rose Blanc Rewined Candle - 11 oz. Vinho Verde Blanc Rewined Candle - 11 oz. This refreshing, zippy white is rooted with tasting notes of bright bergamot and earthy tarragon. Balanced by floral tones of ylang ylang and tart mandarin orange, it�s sure to be your go-to varietal all year round. Chenin Blanc Blanc Rewined Candle - 11 oz. Viognier Blanc Rewined Candle - 11 oz. In this full-bodied white varietal, look for vibrant notes of citrus blended with juicy peach nectar and a hint of soft iris. 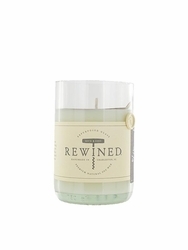 Syrah Blanc Rewined Candle - 11 oz. Zinfandel Blanc Rewined Candle - 11 oz.